Indianapolis Journal, September 23, 1902. Hoosier State Chronicles. This week marks the anniversary of two historic events, neither of them well-known. The scene? St. Vincent’s Hospital in Indianapolis. The story actually begins on September 3, 1902, when President Theodore Roosevelt was visiting Pittsfield in the Berkshire Hills of western Massachusetts. While traveling through town in a horse-drawn carriage, the president and his entourage crossed a set of trolley car tracks. To their horror, a speeding electric interurban car rushing to beat the president’s arrival downtown didn’t come to a stop and knocked the carriage about forty feet. Roosevelt was jettisoned onto the pavement, landing on his face. The Governor of Massachusetts, Winthrop Crane, escaped with only a few bruises. But a Secret Service agent, William Craig, died a horrible death, “ground under the heavy machinery of the car into an unrecognizable mass.” (Craig, a Scottish immigrant and former British soldier, was the first U.S. Secret Service agent ever killed in the line of duty.) The trolley car’s motorman, Euclid Madden, spent six months in jail for his recklessness that almost cost the Commander in Chief his life. 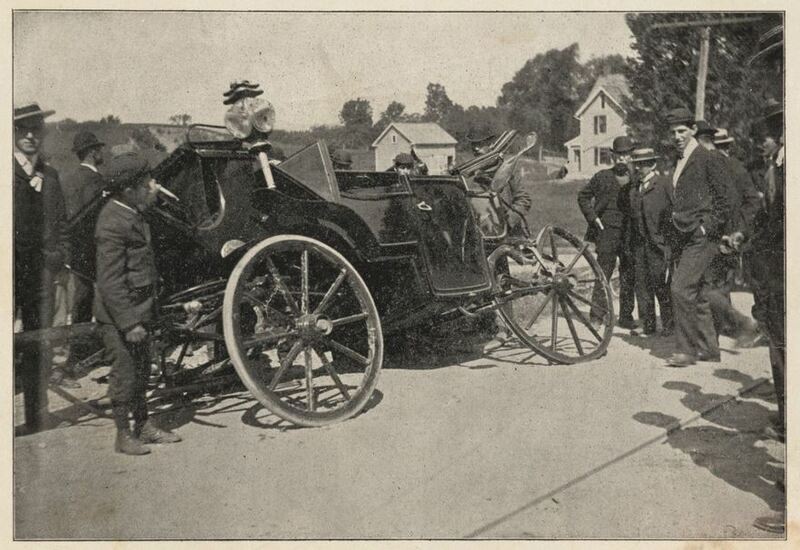 The stricken presidential carriage in Pittsfield, Massachusetts, September 3, 1902. Courtesy Harvard University Library. 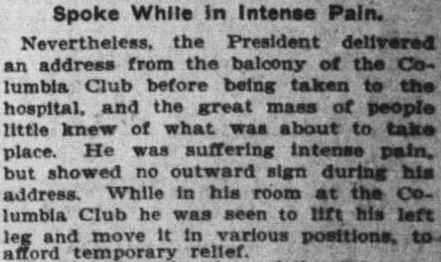 While the press toned down the extent of Roosevelt’s injuries, the president developed a worrisome abscess on his leg, an infection that caused him no small amount of pain. He even spent a short time in a wheelchair. The burly and athletic Roosevelt, however, continued with his itinerary, stumping for Republican candidates during a national speaking tour slated to take him as far west as Nebraska. He did, in fact, make it out to the Midwest, stopping in Detroit, Logansport, Kokomo, Tipton and Noblesville. Twenty days after his narrow scrape with death in New England, however, the leg injury he sustained required an emergency surgery — in Indianapolis. 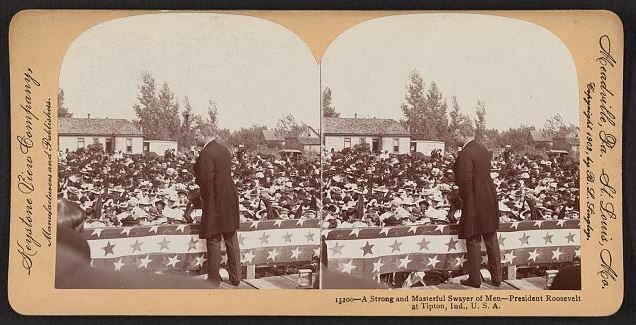 Roosevelt speaks to a crowd in Tipton, Indiana, September 1902. 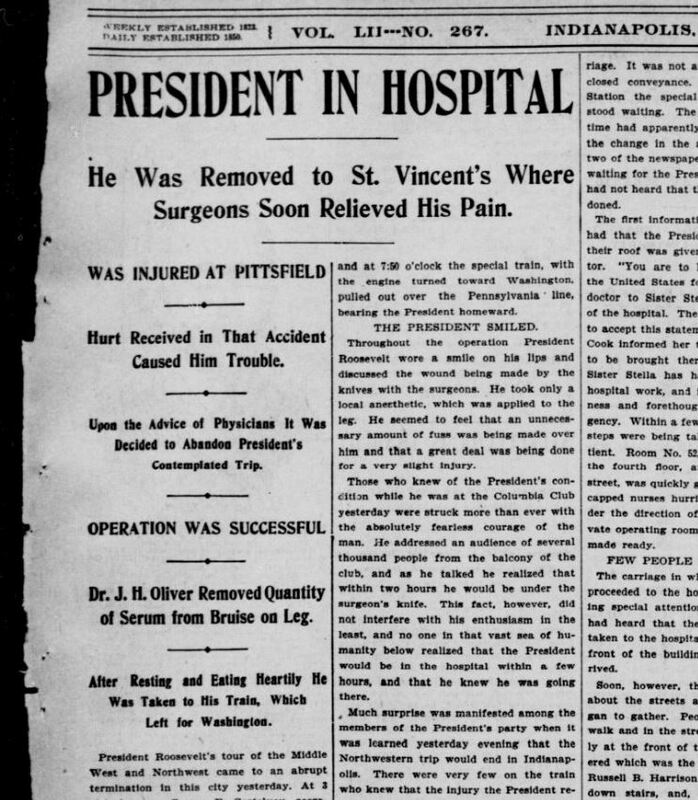 On September 23, after giving a speech “in intense pain” at the Columbia Club on Monument Circle, Teddy Roosevelt, who was limping noticeably and wincing with pain at almost every step, had to have his infected leg lanced and drained at St. Vincent’s Hospital. Accompanying Roosevelt to St. Vincent’s that day was U.S. Secretary of War Elihu Root. (In spite of his bellicose job title, Root went on to win the Nobel Peace Prize in 1912 for promoting goodwill between the U.S. and Latin America.) Root was one of the few government officials allowed inside the building. An anxious crowd of several hundred Hoosiers gathered outside “and never removed their gaze from the hospital.” Even Hoosier senators Charles Fairbanks and Albert Beveridge and Governor Winfield Durbin “were challenged by the guard and not permitted to enter.” Militiamen and Secret Service agents were stationed outside St. Vincent’s. All was silent, only the clip-clop of the occasional soldier’s horse passing on the street. Indianapolis Journal, September 24, 1902. Hoosier State Chronicles. Indianapolis News, September 24, 1902. Hoosier State Chronicles. Men might have taken their hats off out of respect for the president. But the women who cared for Roosevelt at St. Vincent’s that day were justly famous not only for their dedication to the sick and needy but for their very hats. 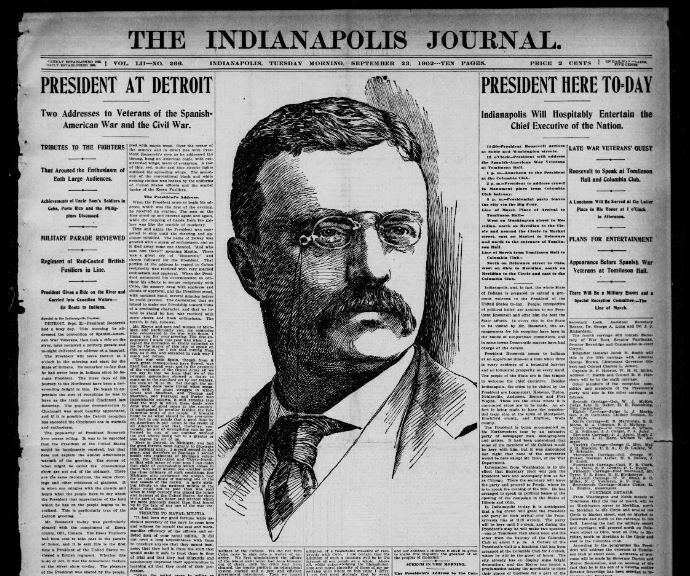 During Roosevelt’s hospitalization in Indy, he was cared for by Roman Catholic nuns. 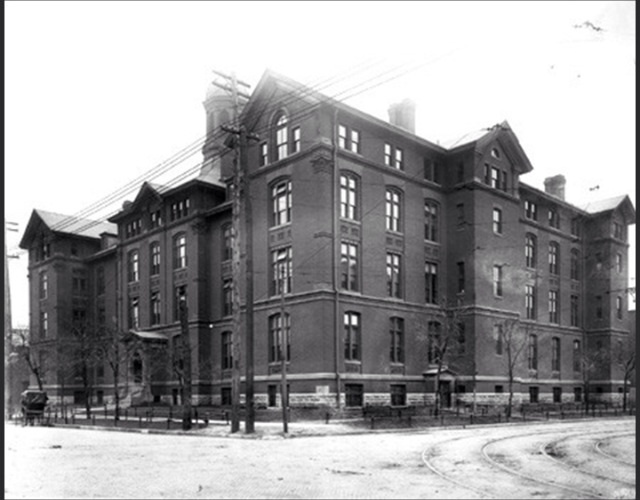 The Daughters of Charity of St. Vincent de Paul, pioneers of American nursing and primarily devoted to the field of medicine, had taken charge of Indianapolis’ second city hospital back in 1881. While recuperating, Teddy Roosevelt must have noticed the sisters’ distinctive and fascinating headgear — known as the cornette — as he lay in bed after the agonizing surgery. 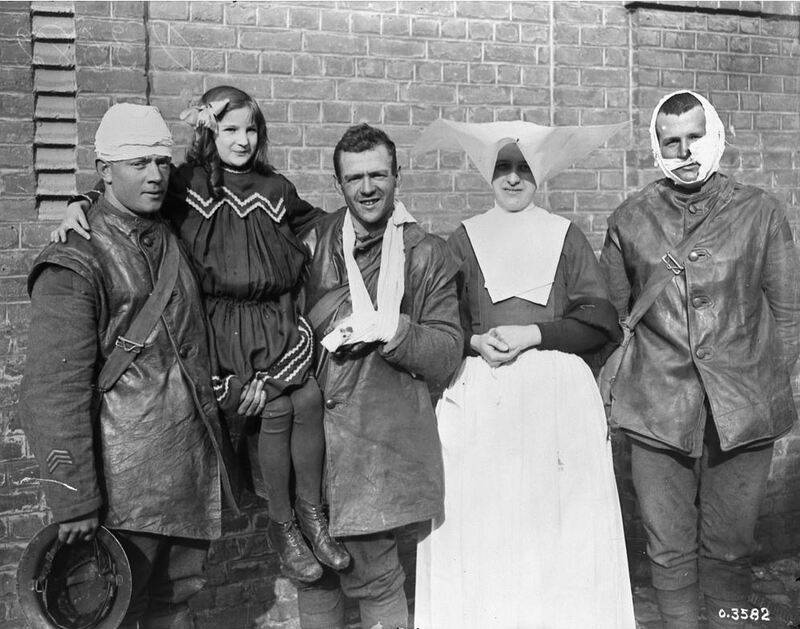 Sister Mary Joseph attended to him alongside Dr. Oliver in the operating ward. Assigned to his private room was Sister Regina, whom Roosevelt remembered from his Rough Rider days, when she was stationed at the U.S. Army’s Camp Wickoff at Montauk Point on Long Island, New York, at the end of the Spanish-American War. We should doff our hats to them, too. This week’s second unheralded anniversary? 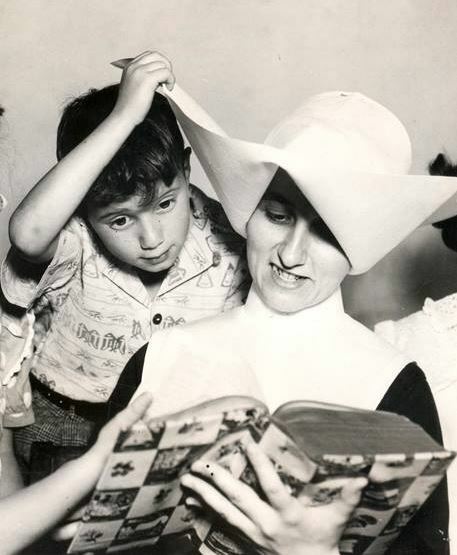 Cornettes, which earned this order of dedicated women the epithet “Butterfly Nuns” or “Flying Nuns,” were abandoned on September 20, 1964. 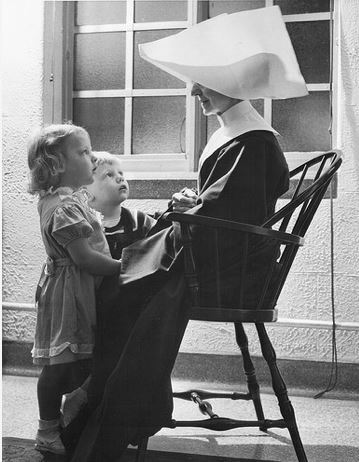 Designed to reflect 17th-century French peasants’ outfits, the nuns’ habits, in spite of the fact that they wore them out onto the carnage of Gettysburg Battlefield in 1863, were considered “impractical for modern use.” A photo from the Greencastle Daily Banner announces the change in 1964. The Daughters of Charity Provincial Archives maintains a small exhibit about Roosevelt’s short time under the care of “God’s geese” in Indiana. 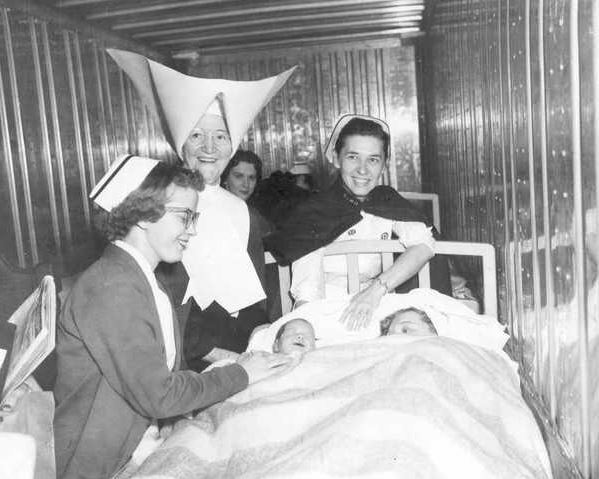 Sister Justina Morgan, second from left, revolutionized health care in Evansville in the 1950s. 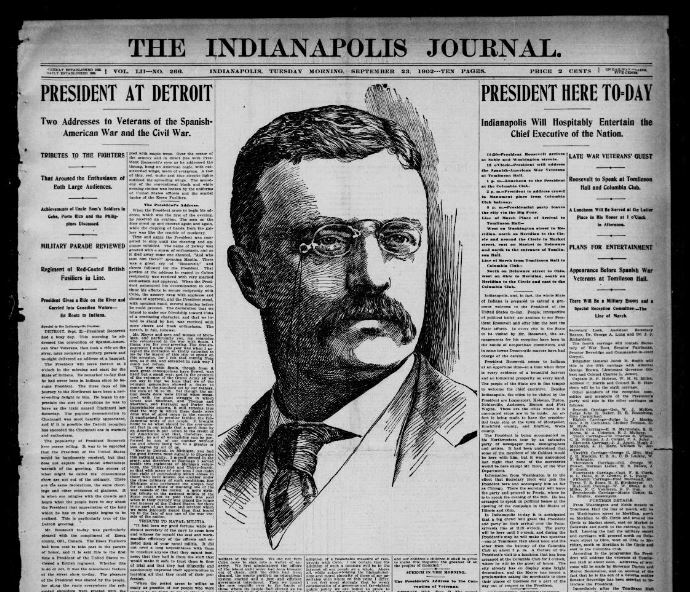 Her predecessors took care of President Roosevelt in Indianapolis in late September 1902. Courtesy Evansville Courier Press. 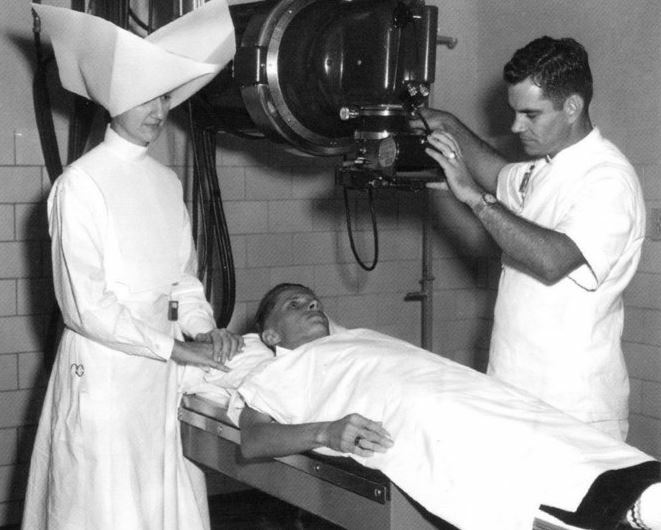 Hospital radium ward, New Orleans, 1963. 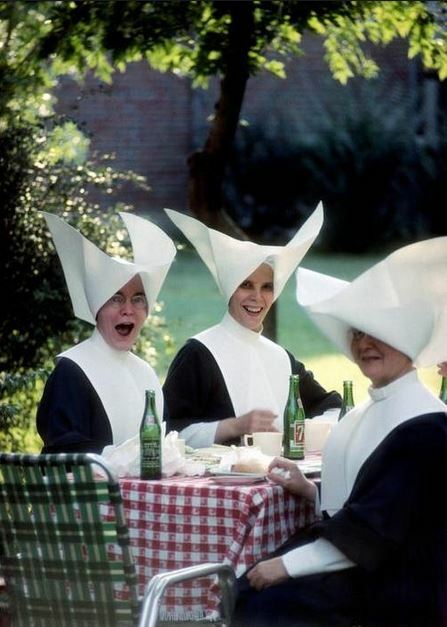 The “Butterfly Nuns” drink 7-UP, circa 1960. The old “seagull’s wings” were swept away by contemporary design. Kokomo Morning Times, Kokomo, Indiana, September 1, 1964.